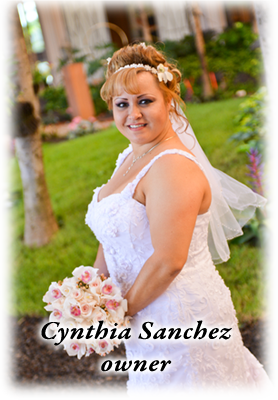 Cynthia’s Custom Decorations is a unique specialty provider of floral and décor. Rental source for affordable quality chair covers, sashes, table overlays, and runners. We take pride in the quality of services and develop a strong long term client relationship based on communication and trust. For the most special events in your life we are here to take your stress and worries away. We want to be not a product but your ultimate resource working within your budget. We coordinate your entire event or work in conjunction with your existing vender. Please contact us to arrange a personal consultation. We provide many services and support such events as Wedding Anniversaries Graduation’s Quinceneras any special occasions. Why let your event be just a moment in time when you can make it the best moment of your life. As a highly renowned full service event center, designing elaborate wedding and events is our passion. Learn more about us by browsing through our website and gallery. Let your imagination run wild and see how we can help make memories of your event last a lifetime. Walla Walla, and the surrounding areas. We look forward to planning your next event.